The practice of labeling, in combination with the culture of impunity and the military involvement in politics, has in the past been identified by national and international fact-finding commissions as one of the main root causes for the spate of extrajudicial killings in the Philippines since 2001. At least 23 lawyers were killed from 2001 to 2009. Many of them were labeled as ‘enemies of the state’ or included in the so-called military watch-list prior to being attacked, apparently because they were identified with their clients or their clients’ causes as a result of doing their job. So far, only one person has been convicted for these killings and this occurred in 2006. 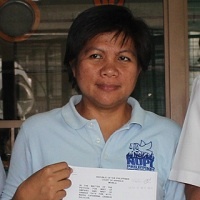 Front Line Defenders has also expressed its concern at the surveillance of Maria Catherine Dannug-Salucon and strongly condemns the killing of William Bugatti, as they appear to be solely motivated by the legitimate and peaceful activities of the two human rights defenders, specifically the legal representation of political prisoners. This entry was posted on	April 24, 2014 at 06:00	and is filed under Front Line, human rights, Human Rights Defenders, L4L.